"Andrew Sims, past president of Royal College of Psychiatrists, has said: The advantageous effect of religious belief and spirituality on mental and physical health is one of the best kept secrets in psychiatry and medicine generally. If the findings of the huge volume of research on this topic had gone in the opposite direction and it had been found that religion damages your mental health, it would have been front-page news in every newspaper in the land"
"Research shows that belief in the paranormal and religion can be conducive to the health and well being of people. These beliefs can help people cope with grief, divorce, job loss, the fear of death, particularly in the terminally ill, and can deter suicide." As far as I know, the first clinician to make use of NDE material in this context was a New York psychologist named John McDonagh. In 1979, he presented a paper at a psychological convention that described his success with several suicidal patients using a device he called "NDE bibliotherapy." His "technique" was actually little more than having his patients read some relevant passages from Raymond Moody's book, Reflections on Life after Life, after which the therapist and his patient would discuss its implicatins for the latter's own situation. McDonagh reports that such an approach was generally quite successful not only in reducing suicidal thoughts but also in preventing the deed altogether. Research shows that belief in the paranormal and religion can be conducive to the health and well being of people. These beliefs can help people cope with grief, divorce, job loss, the fear of death, particularly in the terminally ill, and can deter suicide. Below I include links, quotes, and references to research that shows how helpful religion and belief in the paranormal can be to people. An Exploratory Study of the Effects of Paranormal and Spiritual Experiences on Peoples' Lives and Well-Being by J.E. Kennedy and H. Kanthamani,Original publication and copyright: The Journal of the American Society for Psychical Research, 1995, Volume 89, pp.249-265. Religion 'linked to happy life' from news.bbc.co.uk. In fact, some research has found that people who regularly attend religious services can expect to live an average of seven years longer than their peers who never step inside a church, synagogue or mosque. Grief from the loss of a loved one is often overwhelming and crushing. Religions often try to ease that gaping sense of emptiness through ritual aimed at facilitating gradual release. And the literature on the positive effects of religion on healing is significant. Becker, in his 2007 paper, “Do religious or spiritual beliefs influence bereavement? : A systematic review,” analyzed 32 studies, covering a total of 5715 persons. 94% of the studies showed some positive effects of religious or spiritual beliefs on bereavement [all references below]. There is a comfort that a belief in life after death brings, and it allows the belief holder to better reconcile his loss, to be less gripped by overwhelming fears, to adapt better, and, in some cases, to recover faster. Becker G. Do religious or spiritual beliefs influence bereavement? : A systematic review.” Palliative Medicine 2007; 21(3):207-217. Billings AG, Moos RH. The role of coping responses and social resources in attenuating the stress of life events. Journal of Behavioral Medicine, 1981: 4(2):139-157. Braun M, Berg D. Meaning reconstruction in the experience of parental bereavement. Death Studies 1994; 18(2):105-29. Clarke SM, et al. Religiosity, afterlife beliefs, and bereavement adjustment in adulthood. Journal of Religious Gerontology 2003; 14(2):207-224. Davis C, Nolen-Hoeksemea S. Loss and meaning: How do people make sense of loss. American Behavioral Scientist 2001; 44(5):726-741. Schoenrade P. When I die…Belief in afterlife as a response to mortality. Personality and Social Psychology Journal 1989; 15(1):91-100. What spiritual practices are best? Best practice if you want to experience ESP: Most people experience precognitive dreams when they keep a dream log. If you want to develop spiritually and increase your psychic "in-tuneness": Meditate. Spiritual healing is also easy to learn. But most people have a mistaken understanding of it from fiction and the news media, the link will set you straight and tell you how to do it. "What do they say about the underlying structure of the extended consciousness realms?" Alex, you invited Rupert onto your show and I think it behoves you to listen to him and pose your questions based on his lead. Instead, in this interview, you seem to have had your own agenda and imho didn't listen and engage. At one point when he was going to talk about the resurrection, for example, you even interrupted and cut him off. I for one wanted to hear what he had to say. 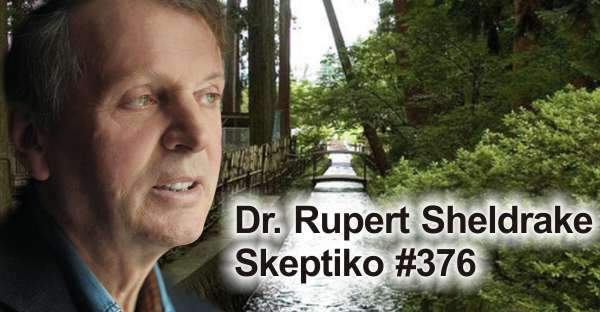 As a result, I don't think I as a listener felt very satisfied with the interview, and I suspect Rupert could be thinking to himself that it was a waste of his time. I'm little wiser as a result of listening and feel a bit deprived, if you really want to know. Could be that you might as well have asked your final questions without having the interview at all. Rupert is no dunce, and if you let him speak, he'll doubtless say what he feels needs to be said in relation to his new book. But I don't believe you did, because (maybe subconsciously -- I'm not suggesting any malice) you wanted to follow your own point of view, and regrettably, I think that could have been at his expense. Sorry if that seems harsh, but there you go: it's honestly how I feel. Am I the only one who thinks Alex's voice is completely different in this interview? The intro sounds like his normal voice, but in the interview itself its very different. It's younger and less husky, I don't know. Can't wait to listen to this one, is it on youtube yet? I think that for many people to stop using the internet would be a great way to start. It would give the biggest result for the least effort. I lost power for two days a couple of weeks ago because of a snow storm, so I am speaking from experience. Stay away from the internet, TV, radio, and newspapers for two days. Try it this weekend. See what happens. The only problem with that, is that the internet has given us so much as well. I am not on FB or anything remotely similar, but honestly, I would have failed to develop any distance from naive materialism without the internet. And the internet is bad for mental health - which cannot be good for spiritual development or discerning truth. Rates of teen depression and suicide have skyrocketed since 2011. It’s not an exaggeration to describe iGen as being on the brink of the worst mental-health crisis in decades. Much of this deterioration can be traced to their phones. Is Social Media Contributing to Rising Teen Suicide Rate?by Elizabeth Chuck, Oct 22, 2017. Recent studies have shown a rise in both teen suicides and self-harm, particularly among teenage girls Sadie's age. And just this past week, researchers in the U.K. published similar discoveries in a study on self-harm that showed a dramatic increase in the number of adolescent girls who engage in it: Self-harm rose 68 percent in girls ages 13 to 16 from 2011 to 2014, with girls more common to report self-harm than boys (37.4 per 10,000 girls vs. 12.3 per 10,000 boys). Part of the problem is that internet apps are designed to make you use them compulsively. It's not just that they use up all your time. They destroy your attention span. There are kids on the reddit meditation forum who say they can't meditate for more than a few minutes. And reading news and debating in forums etc causes many people a lot of stress. It is hard to get in tune with the spiritual "vibe" when you are stressed. See quotes below: Facebook insiders admit they are destroying society and they knew what they were doing. And like, I don't know if I really understood the consequences of what I was saying, because the unintended consequences of a network when it grows to a billion or 2 billion people and it begins, it literally changes your relationship with society, with each other. It probably interferes with productivity in weird ways. God only knows what it's doing to our children's brains. If the thought process that went into building these applications, Facebook being the first of them to really understand it, that thought process was all about: 'How do we consume as much of your time and conscious attention as possible?' And that means that we need to sort of give you a little dopamine hit every once in a while, because someone liked or commented on a photo or a post or whatever. And that's going to get you to contribute more content, and that's going to get you more likes and comments. It's a social-validation feedback loop it's like exactly the kind of thing that a hacker like myself would come up with, because you're exploiting a vulnerability in human psychology." The inventors, creators — it's me, it's Mark [Zuckerberg], it's Kevin Systrom on Instagram, it's all of these people — understood this consciously. And we did it anyway. https://journal.thriveglobal.com/ho...ian-and-google-s-design-ethicist-56d62ef5edf3“It’s easier to fool people than to convince them that they’ve been fooled.” — Unknown. I’ve listed a few techniques but there are literally thousands. ... it persuades us to spend as much time as possible online, with tactics ranging from Snapchat’s snapstreaks to auto-playing videos on sites like YouTube and Facebook. ... a growing body of research suggests that the use of social networks including Facebook, Instagram, Snapchat, and Twitter may have negative consequences, like increasing your chances of depression or social isolation. Indeed, simply having your phone around could lower your cognitive capacity. “Everything [Facebook] knows about me can be used to persuade me toward a future goal,” he says. “And it’s very powerful; it knows exactly what would persuade me, because it has persuaded me in the past. Alex sounded tired, like he was a bit run-down from fighting off a cold. ...you seem to have had your own agenda and imho didn't listen and engage. Alex did not seem overly combative or discourteous in this interview. He did his usual thing of asking difficult questions, which we like. One weird thing I've noticed is that Alex is really irritated by the concept of Bible Inerrancy. I was a F.U. Hard-Kore Atheist for many decades because I was raised in the Southern U.S. around snake-handling, tounges-speaking Pentacostal fundie nutjobs. I learned my way past that to become somewhat of an esoteric Christian. I suspect my parents being Agnostics who never attended church actually made that easier for me than it will be for Alex who was forced to attend a church when young. We have a mental health epidemic that no one is willing to acknowledge and it is caused by the internet and the news media. I'd like to try to keep this thread roughly about the podcast, so it would be good if the discussion about the internet could be continued in another thread, please. No - I disagree with this - Rupert was given a long period where he described his early life.I think it was reasonable for Alex to discuss the relationship between Christianity and spirituality. I was interested to learn that part of Rupert's decision to return to Christianity was the fact that some holy men he encountered had no interest in the welfare of mankind. I liked this interview, and it looks as if his new book covers new territory. I wonder if Susan Blackmore will be changed because she has/will be her going to Brazil to take Ayahuasca! Alex, I very much appreciated your point about Jesus having truly existed or not etc being important in itself - the "shut up and calculate" approach to "ultimate Truth" that seems to be advocated (among others) by Rupert Sheldrake is certainly interesting and worth analysing but, ultimately, it is unsatisfactory to me as it is to you. So thank you so much for asking that important question. I was however not surprised by the answer (or rather, the way he avoided answering....). I have an extremely high opinion of Dr Sheldrake but I think that, like many other people, he has chosen the soft option of just saying "if Christianity and its rituals work (make me feel good), it's good enough, I don't need to know if any of it is based on something real". In other words, Christianity may "work" like a placebo may work, but as long as it works it needn't contain an "active ingredient" (= actually be the one and only revelation of the Ultimate Truth or even be based on historical facts). Anything goes, really, as long as it works (ie, any religion or belief in something 'spiritual'). I suppose even belief in the Tooth Fairy or Unicorns or Father Christmas would be perfectly OK if it worked, based on this approach - why not? So, I don't mean to be dismissive of what Dr Sheldrake said (or even of people who believe in Unicorns or in the Tooth Fairy) but, like Alex, I don't find this approach intellectually satisfactory.